i'm sharing: Teapot Dome is a montage with a picture of the facade of the Getty Research Center building as the dominant building block. 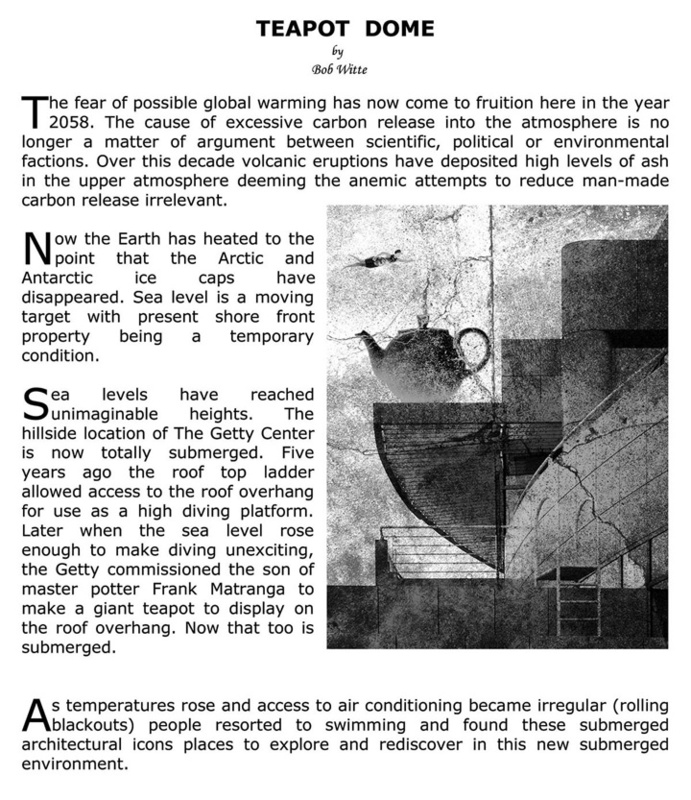 Embellishments to the montage support the current concerns for repercussions of global warming and the story that I created. this was inspired by: The idea of combining a fictional story with an abstract image began when I was told about one of Minor White's classes. I knew a fellow that described his experience when taking a class taught by Minor. Minor would hold up a photograph and ask members of the class to act out, through dancing, how the image made them feel. That experience implanted the idea in my mind that surfaced many years later while I was making montage images. Since then, I have fictionalized stories about several of my abstract/surreal montages. These images permit unusual and even bizarre interpretations. to me, inspiration is: I expressed the feelings and memories that the image suggested to me with a realistic story.